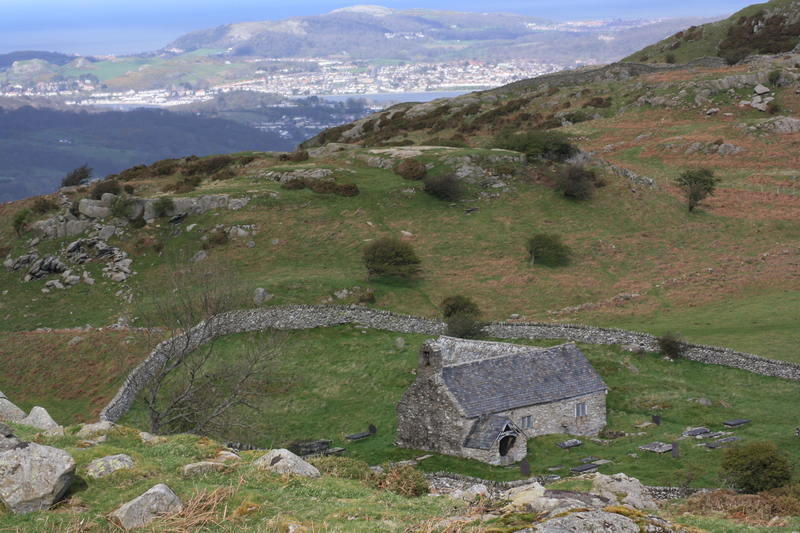 Llangelynin Church lies high in the hills overlooking Conwy and Penmaenmawr. The church, used now for three services a year sits in glorious isolation. However, this has not always been the case. In the past it was at the heart of a thriving agricultural community, and a stopping off point on a drovers route approaching the crossing of the River Conwy. We had previously visited Llangelynin’s most well known well, that of St Celynin to which sick children were brought from all over the area. We returned on this occasion to hunt out another local well. 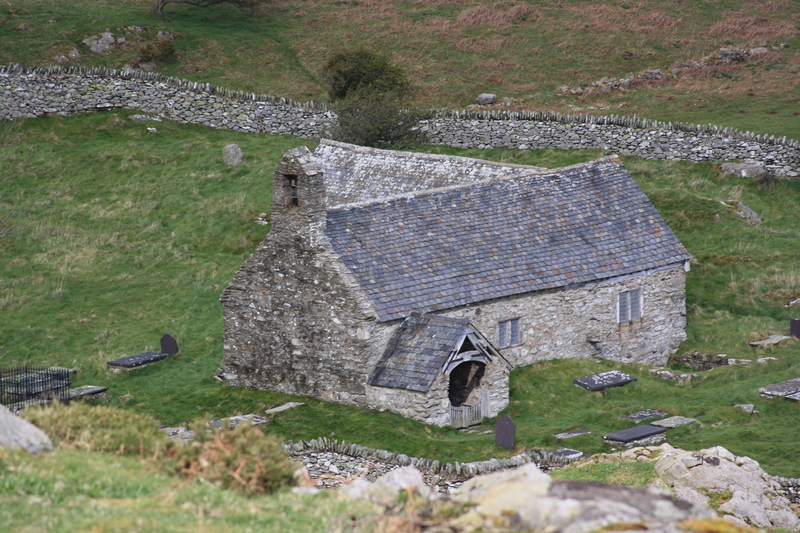 Ffynnon Gwynwy is located about 200 yards along the drovers road in the direction of The River Conwy from the church. The well is marked, although not named, on most of the ordnance survey maps from the past hundred years. On the left hand side of the road that passes the churchyard, and about two hundred yards from it, is a small spring called Ffynnon Gwynwy. Any one troubled with warts, upon making an offering of a crooked pin to the well, lost them. Fifty years ago the bottom of this little well was covered with pins; everybody was careful not to touch them, fearing that the warts deposited with the pins would grow upon their own hands if they did so. But the belief in the efficacy of the water has departed, and the well presents the appearance of a hole filled with clear water, overgrown with weeds. It took us three visits to identify the well. We always seemed to pick rainy times of year and there was “water, water everywhere” making it difficult to distinguish between springs and puddles. 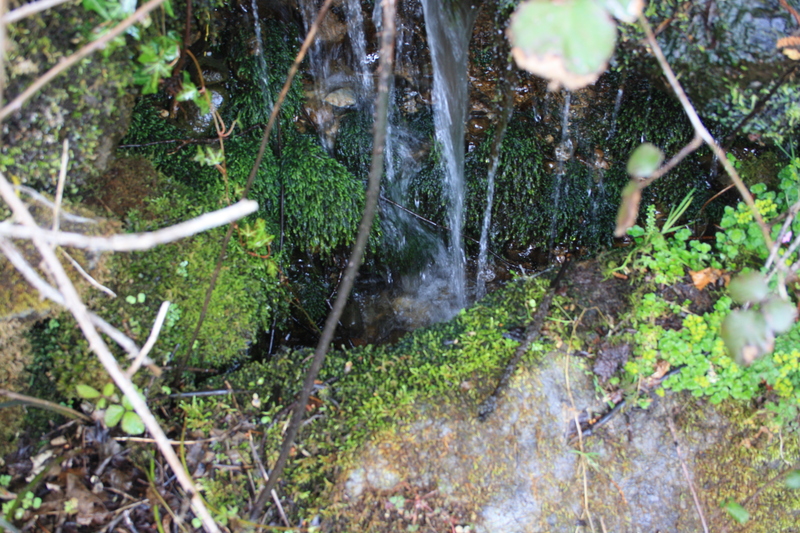 A small stream flows down from Celynin’s well, through the fields to the left of the track, often spilling over onto the lane. About 200 yards down from the church it finally decides to meet up with the lane, forming a little waterfall through the wall before being carried away under the lane in a large pipe. At the point where it crosses a stone chamber has been built to catch the flow and direct it into the drain. On our initial visit we assumed, for lack of alternatives, that this was the well itself, it certainly fits the location and looks the part. I was never totally convinced, however, and on our most recent visit in March 2014 we were lucky enough to meet with the farmer restoring the walls along the lane. He very helpfully led us to another location some thirty or forty yards upstream that he knew of as a spring. To be fair we would never have found this in hours of searching without his help. 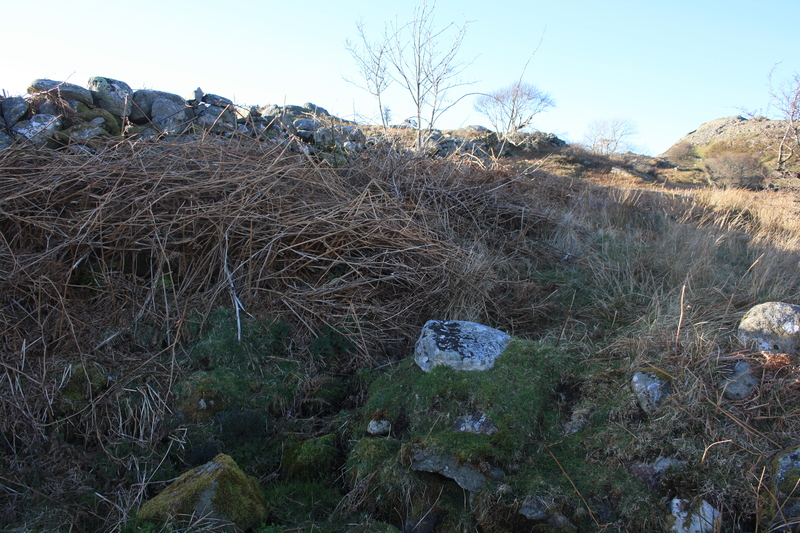 At the base of a wall, curving away from the lane up the hillside, a small stream flows out from under the wall, choked with grass and reeds it flows some 10 yards down a small bank to join the main stream across the field. 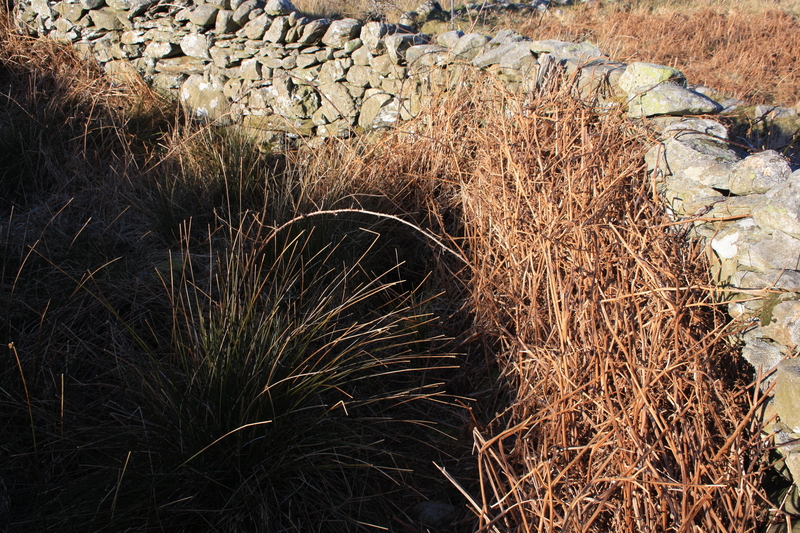 On the opposite side of the wall, inside the curve and once again choked with reeds is a small pool which appears to be the source of this stream. Twenty yards or so away are the remains of ancient hut circles This spring must have represented an important water source for communities for thousands of years. I believe now that it is this spring that represents the most likely location of Ffynnon Gwynwy,. 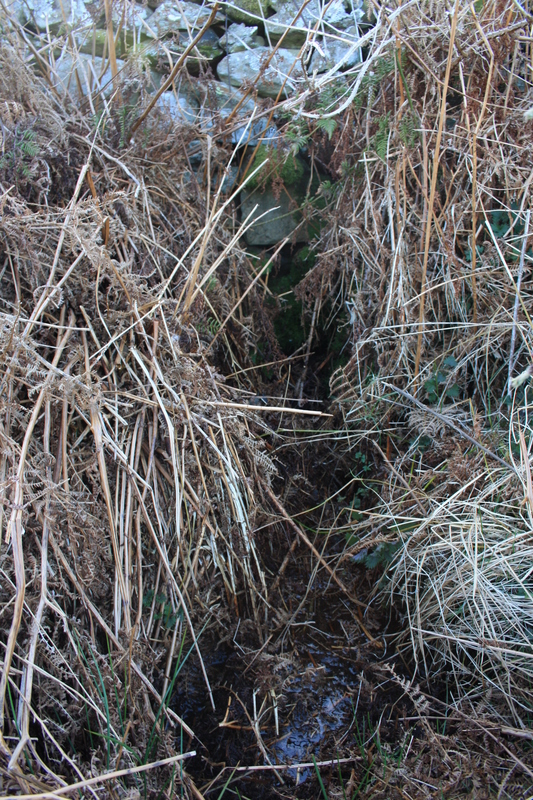 The farmer assured us that if he ever got up to clearing out the spring he would keep a close look out for (and be wary of) any remaining pins. Francis Jones  includes Ffynnon Gwynwy in his category A group of wells, namely those devoted to a particular saint, or religious designation. I have been unable to identify a St Gwynwy, and the other literature does not provide a derivation for the name, so it is uncertain how this classification derives. Jones F (1954) Holy Wells of Wales. University of Wales Press.